Look for a part-time job that offers the chance to engage with your hobbies and passions on a more regular basis. Never too late to learn … and teach! Imagine finding a whole new area of learning when you decide to help others learn? 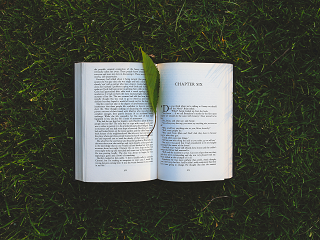 This is what Chartered Wealth Solutions client, Roy Irvine, discovered when he volunteered for the Link Literacy programme. If you love dogs and manage them well, offer (and charge for) your services as a doggie day-carer, or a pet- and house-sitter. Some families need someone to visit an aged relative or take him or her out shopping. Other families would appreciate a responsible driver collecting and delivering their children from school to home, and you can make an income. If you love to cook, create a manageable cooking school in your home – invite friends to learn how to make the best pastries, breads, healthy meals. They can pass the word on, or sign up their domestic workers for a course. You can also become a party chef – so many non-cooks would love to hand over the responsibility of producing a delicious meal. If you just want to help a charity, why not host a “Pay-for-your-Plate” meal, where you charge for the meal and donate the funds to your selected charity? Many retirees enjoy hawking their wares at local venues like craft fairs, art shows and farmers markets. It’s a nice way to get out of the house, interact with customers and generate income in the process. But why not expand your reach by taking advantage of online marketplaces as well? Whether you’re a polished piano player, a witty writer or a master at mahjong, you can likely earn income in retirement by teaching others how to do what you do so well. If you prefer to stay local, look at teaching opportunities at continuing education programs offered through your town, community colleges or private adult education programs. Or you can offer lessons out of your home. 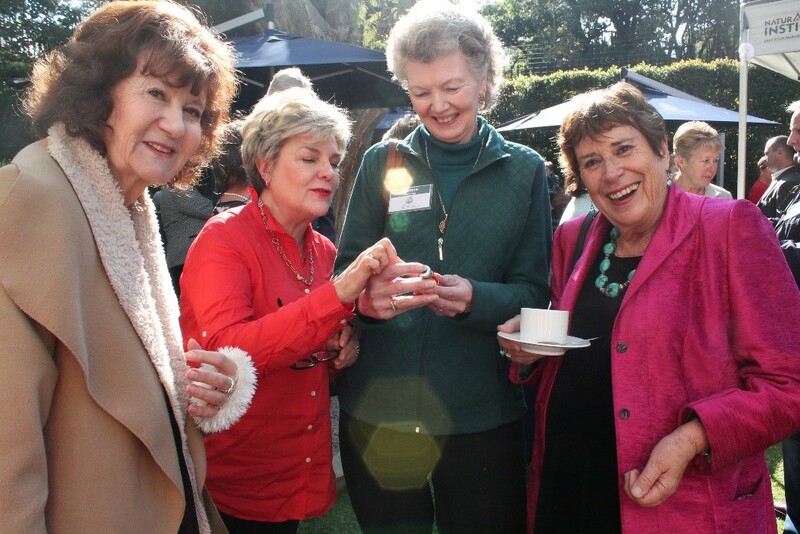 See Gill Orpen offering Bridge lessons in this newsletter. Finally, remember that as great as technology is, the best opportunities for work in retirement often surface from everyday networking. So, keep your antennae on alert. This article contains valuable principles for parents of children of any age, bar very young ones. It is written by Richard Watts, author of ‘Entitlemania’ on adversity as a teaching tool. Many of us believe the wisdom we distill from surviving life’s obstacle course is best directed at rescuing our kids from the difficulty and heartache of similar growing experiences. More strategic than yesteryear’s helicopter parents, today’s drone parents seek out and destroy perceived impediments to our children’s success. But it is not the successes of life that expose our kid’s uniqueness. As Michelangelo said of his statue David, “David was always inside the block of marble. It just a matter for the sculptor to hammer and chisel away the pieces that didn’t belong.” Life’s setbacks and sufferings help us to identify and embrace what is most important to us. To separate the valuable from the meaningless. To find our own way. Why would we want any less for our children? Most parents love their children. But love is a tricky word. For many parents, love means protecting and making sure no harm comes to our kids. These are well meant efforts. However, I prefer to think of love as an unconditional promise to affirm our kids without interfering in their life course. That used to be called tough love; often as tough for the parent as for the child! You say: How can I allow my son or daughter to stumble down a path that may be detrimental or destructive to his or her future? Think of your own life experience: Life took numerous directions your parents may have thought negative. You recall some of these times as being so disorienting and destructive, they caused memories of permanent hurt. Although sometimes painful, these detours provide us contrast, teach discernment, groove a confident path and ingrain the skill of recovery. Adversity is a teaching tool more valuable than success. Sometimes, wrong choices help our children identify the right ones. And once the right direction is selected, their passion energizes the will to outrun any obstacle because of one thing they have realized: they care deeply about the finish line. Yet as parents, we often manipulate our child into choices that are preferred by us, with no regard for what our child may have wanted for himself or herself. Parents prefer their children have a certain future, although intuitively they know uncertainty plays a significant role in them finding their path. What our children deserve is an authentic story … their story. One they believe in. It might take several attempts at different opportunities. And what is the risk to you? They might fail. You should respond with encouragement and affirmation, because if we script their lives, they will never identify the inner passion which gives them the self-stamina to drive through adversity. They need to be allowed to stumble, yet recognize with perseverance they will eventually find their way. One has to be lost to be found. Our children need to determine what personal goal is worth giving their all. Sometimes that requires them to walk into walls. Absent a path of self-discovery, our children will never realize and develop the natural gifts that make the an original instead of a copy. Richard Watts, author of Entitlemania: How Not to Spoil Your Kids, and What to Do If You Have, is a personal adviser and legal counsel to clients, and founder and president of Family Business Office, a legal and consulting firm in Santa Ana, Calif. In his project to track how people perceive beauty, from a child to an older person, Louie Schwartzberg records an interview with each. It is the older man’s profound insights that were most striking. Click here to watch the TED Talk. You think this is just another day in your life? It’s not just another day. It’s the one day that is given to you today. It’s given to you. It’s a gift. If you do nothing else but to cultivate that response to the great gift that this unique day is, if you learn to respond as if it were the first day in your life and the very last day, then you will have spent this day very well. Begin by opening your eyes and be surprised that you have eyes you can open, that incredible array of colors that is constantly offered to us for pure enjoyment. Open your heart to all these blessings, and let them flow through you, that everyone whom you will meet on this day will be blessed by you, just by your eyes, by your smile, by your touch, just by your presence. Let the gratefulness overflow into blessing all around you, and then it will really be a good day. Now you can volunteer from the comfort of your couch! Want to give back but don’t know how? Want to be involved but you are somewhat home-bound? Want to make a contribution but quite busy? The organisation For Good, has made giving back easy! You can contribute your time, skills and expertise to helping organisations achieve their charitable aims. Become part of the Virtual Volunteers. By connecting to causes online you can get involved with social change in a real and impactful way – and all without having to rework your busy schedule. If you can’t find anything at For Good online that speaks to you, think about CREATING AN OFFER of something you can do – giving back on your own terms! Click here to see what is needed. If you have experienced a life planning meeting at Chartered, or attended one of the RetiremeantTM workshops, you will have encountered the colourful and very useful Wheel of Balance. The Balance Wheel is a tool that Chartered Life Planners use in their meetings with clients. The purpose of this approach is to assist clients to create a balanced and holistic life, one that takes all eight categories into account. Because Chartered believes in living its own philosophy, each year the Chartered Family commits to giving time and money to support those who are championing give-back initiatives in their communities. The give-back category in the Balance Wheel is essential, we believe, to living a well-rounded and content life. 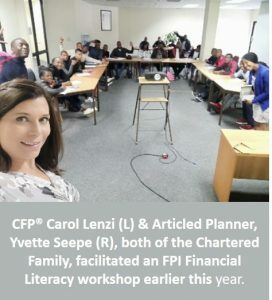 This year, members of the Chartered Family ran Financial Literacy workshops for the public, as part of the Financial Planning Institute of Southern Africa’s broader programme to educate the South African community. The programme includes essential skills such as budgeting, managing debt, saving and planning your finances, and runs throughout the year. Chartered also ran these workshops with the staff of LEAP Science and Maths School Alexandra. 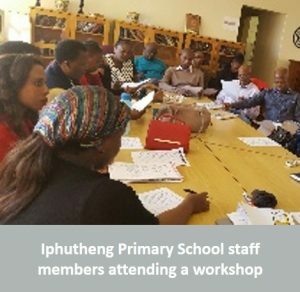 Chartered Legacy & Trust provided invaluable services to the staff of our long-time partner, Iphutheng Primary School in Alexandra, by providing advice on Wills, and helping those staff to set up valid Wills. This will be an ongoing relationship, as Wills are reviewed every year to remain an accurate reflection of testator’s wishes. 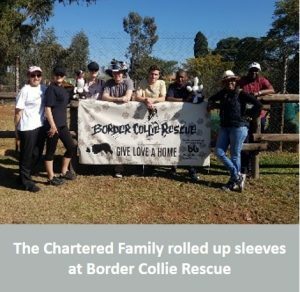 This year it was Border Collie Rescue that received two visits from the Chartered Family, to paint and plant and play. This project has had an influx of animals from deceased farmers, and so was very grateful for the donation of plants, food and toys. 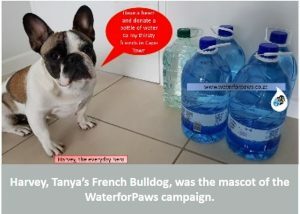 Also caring for animals, our Family responded to a crisis for water at shelters in Cape Town by collecting bottled water. This was the Water for Paws temporary project that enjoyed much support. Our environmentally conscious Tanya Correia continues to challenge the Chartered Family to be aware of the impact of plastic on the environment. She drove a challenge to recycle plastic for owl houses – an initiative with a dual outcome: homes for these amazing feathered creatures and repurposing plastic. 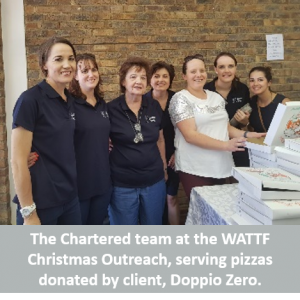 Partnering with Women At The Threshing Floor for the fourth year, Chartered supported the Winter and Christmas Outreaches by this not-for-profit organisation that helps child-headed households in Alexandra. The ladies of Chartered Tax again threw their weight behind the collection of stationery packs for the children. The Chartered Family generously pitched in and added toiletries to the donations. Finally, Chartered has been collecting clothing for youth work acceleration programme, Harambee. This project prepares young, unemployed youth for interviews by running interview, CV and life workshops. It has grown to 39 branched countrywide and has created significant corporate partnerships with well-known brands. Chartered clients are always welcome to become involved with Chartered, in whatever capacity they wish. You need only contact Tom Brukman or Kim Forbes. Out of adversity comes strength. It’s a familiar adage, as are the variations on it: opportunity, triumph and greatness are all optional outcomes. 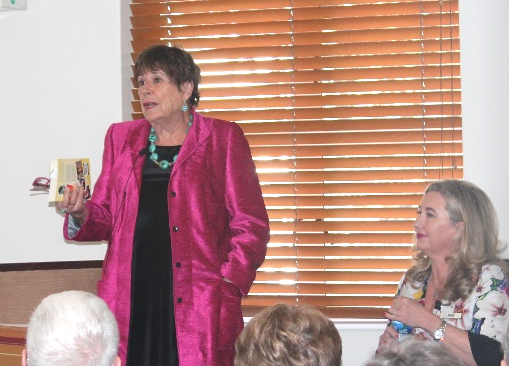 The indomitable Kate Turkington, guest speaker at our recent Lifestyle Lunch, has her own version: out of adversity comes the courage to live every moment to its very fullest. Kate holds to the Buddhist wisdom distilled into these few words: The past is gone. You can learn from it, but it’s gone. The future never comes. So, live in the moment. In Kate’s past lies the tale of two little girls, aged four (Kate herself) and six (her sister, Rita) who numbered among the million and a half children evacuated in 4000 trains over four days to rural England during WWII. Out of these six months of exile came Kate’s resolve to savour the present, to live singing Carpe Diem. “You have no control over the past or the future, but you do have control over the present moment,” she affirms. It’s a life philosophy that started with Kate’s mother, who had quietly pointed at the moon and told her children: “There’s the moon – if you want to go there, go for it!” (and this long before Neil Armstrong took that first giant step on 20 July 1969). Kate describes her book, Yes, Really! as A Life, rather than a memoire. And it is not surprising to see why. From the Dalai Lama to ghosts and angels to a talking dog … Kate has interviewed them all. One of the most memorable – and also one of the saddest – was a conversation with a man who counselled the dying; he said that most men regret not spending more time with their families, and most women wish they had done more with their lives. Travel has very much been a part of Kate’s life experiences, career, personal growth, and enduring joy. “I was in nine different countries last year, mostly on assignment as a travel writer. Let me tell you, there is no country like South Africa. We laugh at ourselves, our media is free, our Civil Aviation industry is globally superior, as is our Reserve Bank … there is just so much good we don’t always hear about.” Asked to describe her city, Johannesburg, in three words, Kate was clear: sunshine, energy, diversity. Kate vividly remembers a friend whose family had a sewing machine, but one which sat unused on the shelf. Her young friend had been warned, “Don’t try to use the machine – the needle may go through your finger!” It was an apt illustration of the danger of holding back from life for fear of a possible or imagined hazard. Left: Chartered guests are fascinated by Kate’s charm from La Paz, Bolivia. “We all need a little magic in our lives,” laughs Kate. Want to work in Retiremeant™? Prepare now – three things to do. We exert much effort and discipline in ensuring we are financially secure in Retiremeant™. But, many neglect that aspect of planning for Retiremeant™ that is almost as important – what we will do that gives us the same sense of significance as that of our careers? Whatever this work looks like (full-time, part-time, consulting, mentoring, in a new industry, volunteering at a public benefit organisation), there are ways to prepare ourselves for a new or renewed career. We may believe our current employers will retain us part-time, but there is no guarantee, so it is important to keep ourselves employable in a competitive market place, or be equipped to create our own venture. Remember, you don’t have to be working for remuneration. It sounds obvious, but if you are not healthy, it is likely you will be challenged to perform well or enjoy your work to the fullest extent. Besides keeping your skills up-to-date, research what expertise is in demand. Put yourself on LinkedIn and check the job profiles. Some people find new avenues of interest through further study, hobbies and interest groups – and these can translate into work and useful networking. Explore online opportunities to study. Don’t assume that work in Retiremeant™ will or must look like your career. Be adaptable. Instead of managing, could you mentor? Instead of being paid could you volunteer? Instead of being an entrepreneur could you be part of a collaboration? It’s essential to have a plan, but life is unpredictable, so it’s important to have a Plan B and Plan C.
Don’t miss the benefit of simply chatting with others. There is so much to learn and share. I have very fond memories of my grandmother reading me the Sunday newspaper comics when she visited on that day. She seemed to have a congenial relationship with my parents and, certainly, I felt her love. Little did I, as a child, know that these family relationships can be fraught, with boundaries often unclear or ignored. So, the advice in this article by Barbara Graham, a Grandparents.com columnist, is helpful. On the one hand, it was so simple. There was a new baby, Isabelle Eva, and there was nothing to do except love her. That was the one hand. The other hand, belonging to her parents, held all the cards. Seal your lips.Even if you’re an expert, your adult sons and daughters will assume you know nothing about childrearing. Your advice and opinions will not be welcome, unless directly solicited. (Even then, it’s iffy as to whether the new parents really want to hear your answer.) Tread lightly. Love thy grandchild as thine own — but never forget he or she is not thine own.I was confused about this in the beginning. I was at the hospital when Isabelle was born, and I thought we were all one big happy family. Not. I had to win over her parents. They loved me — I knew that — but did they trustme? In the early days I felt as if I were auditioning for the part of grandparent. Did I hold Isabelle properly? Didn’t I know that you never put a newborn down on her stomach? It took me a few blunders to secure their trust — which must be renewed every so often. Abide by the rules of the new parents. The dos and don’ts of childrearing change with every generation. Had I listened to my mother, I would have held my son only while feeding him (every four hours) and not a second longer, lest he turn into a “mama’s boy.” These days, with all the childrearing information online, most new parents are up to speed, but we grandparents definitely are not. Baby slings? Mutsy Slider Stroller? Who knows what these are or how to operate them? Get a life. Sometimes I’ve become overly embroiled in my concern for my son and his family; at other times my desire to be an integral part of their lives has taken precedence over things I needed to do to maintain my own sense of well-being — and I’ve paid the price. Hence, my mantra: “I have my life. They have theirs.” We are close and connected, yet separate. Boundaries, boundaries, boundaries. Let go of all expectations. When Isabelle Eva was born, she lived around the corner from us, but when she was two months old her parents moved overseas. I was heartbroken; my expectations about my involvement in her life were turned upside down. Yet once I was able to let go of my agenda — it took some doing — I found I still felt deeply connected to Isabelle and vice-versa. Now we visit her as often as we can and, in between visits, Skype and talk on the phone. 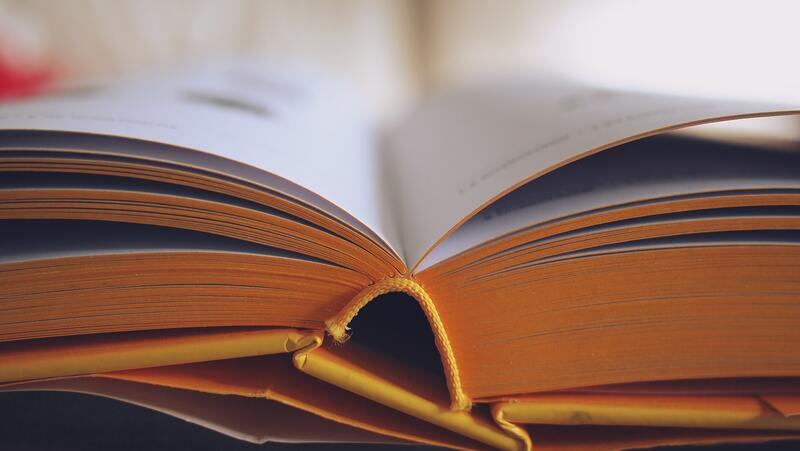 There are bound to be unpredictable plot twists in every family narrative, but unless you are raising your grandchildren, your adult children are writing their own story. Who knew that grandparenthood would offer so many new opportunities for personal growth? Having my 90-year old grandmother staying over occasionally has shown me that there are particular needs of an older person to be taken into account, and especially more so for longer visits, say over the festive season. This article is useful for those preparing to host older loved ones in the long term, but I also found some valuable tips for me as sometime host. When you become a caregiver, you need to prepare for your loved one’s arrival. Preparing your home for a disabled or ill adult is much like childproofing your home. Each room must be reorganized and made as accident-proof as possible. Maria Sandella (www.articlecity.com) has created a room-by-room checklist as a guide. Are all electrical and telephone cords secured or out of the way to avoid being tripped over? 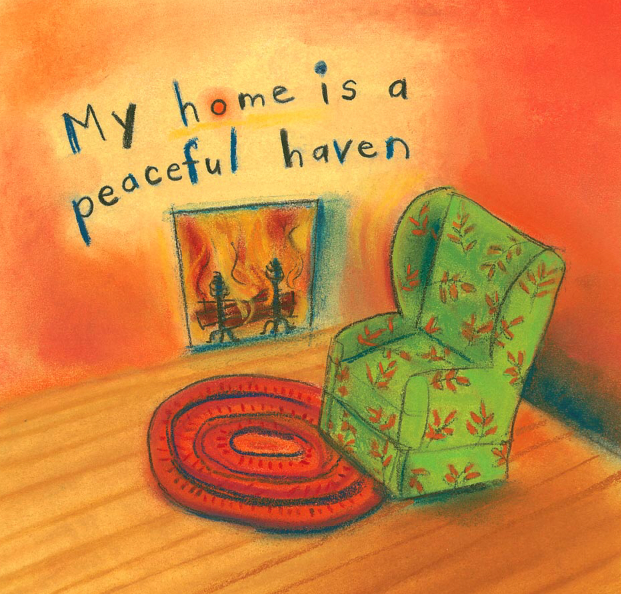 Don’t run cords under rugs or furniture, they become damaged or frayed; don’t use nails to secure them down. Will your loved one be able to turn lights on and off easily? If not, try touchable lamps or lamps that react to sound. Do the doors and windows open easily and lock securely? Are walking pathways free of clutter? Will your loved one be able to get up and down from your sofa and chairs safely and easily? Straight back chairs with armrests and firm seats may be a wise investment. Add a firm cushion to your existing chairs – adding a bit of height will make it easier for them to sit down and get up. If your loved one still uses the phone, perhaps purchase a telephone with large push buttons to make dialing easy. Program all emergency numbers into speed dial, and also write the numbers down and tape them to the wall by the phone. Obtain an emergency call system in case of fall or injury. Obtain a wireless intercom system so you can be easily reached if the person needs assistance. Make sure a television with remote control is accessible. Are your appliances in working order? Are your pots and pans, utensils and food easily accessible? Are all flammable materials away from the stove? Are sharp objects stored in a safe place? Is there adequate space to work? Can all kitchen outlets be reached safely? Is it easy to transfer food from the cooking area to the eating area? Are the sink faucets easy to turn on and off and easy to reach? Is the entrance to the bathroom easily accessed and free from clutter? Will your loved one be able to get in and out of the shower/bathtub safely on their own? If not, install grab bars on both the inside and outside of the bath/shower. Towel racks are not sturdy enough to be used as grab handles. Make sure the shower/bathtub has a waterproof wireless intercom so assistance can be summoned. Can your loved one shower safely standing up or is a chair needed? Purchase one with non-skid pads. Have you placed non-skid strip pads and a bath mat in place? Have you installed a raised seat, a safety frame or a grab bar for a safe transfer to the toilet? Can the outlets, and light switches be easily reached? Do you have a nightlight for those midnight bathroom trips? Consider purchasing an electric bed if your loved one has problems getting in and out of a regular bed safely. You can also install a trapeze bar for them to use. Can the bedside light be reached from bed? Is there a phone that can be reached from bed? Is there a wireless intercom that can be used to reach you in case of emergencies? Is there a clear path from the bed to the bathroom? Do you have guardrails on the bed to ensure your loved one does not fall out during the night? Do you have working smoke alarms and fire extinguishers throughout your home? Periodically check to make sure they are working. Do you have emergency numbers such as the hospital, fire, and 911 by the phone? Have you placed night lights in every room of the house if your loved one is a night wanderer? The little bit of light they do give off will help to prevent tripping and falling. While this may seem like a lot of work to get your home ready, it really isn’t. Go through each room one at a time and make a list of things that need doing, based on your loved one’s disability or illness. You may find you are more prepared than you thought. There are some wonderfully practical and inspiring snippets in this NextAvenue.org article to regret-proof our lives. I found number 6 my most challenging … and I like number 8’s idea of an outdated script. It’s time to take charge and live the life you want. Granted, it’s one of the less fun things to do in life, but experts say that “aside from any legal benefits, planning your estate is truly a selfless act. If you are without a plan, you leave your heirs wondering about your wishes, which can lead to problems and fighting. When you take time to plan your estate, you remove the burden from them by letting them know exactly what you want. It does not matter whether you’re single, have minimal assets, whatever, put a plan in writing. 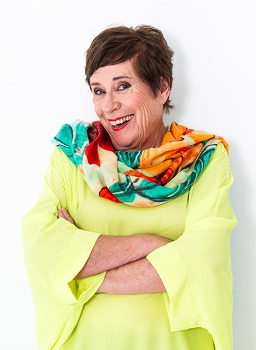 If you’ve reached your 60s, you already know that friendships often change during transitions – a new job, having kids, getting divorced or widowed, relocating. But you’re never too old to make new pals. Look for people who seem interesting in your tennis class, at volunteer functions, with common hobbies and strike up a conversation – ask a question, make a comment. Someone has to initiate. It might as well be you. Next – a coffee date, a walk, a golf game or a knitting session together. No question, good genes help with healthy ageing. But you still have some control here. Make sure you ask your doc when and how often to have these screenings: blood pressure, PSA (prostate), colonoscopy, mammogram, pelvic exam, papsmear, eye exam (macular degeneration, cataracts, glaucoma are common with age), cholesterol, vaccines (shingles, pneumococcal, flu shot, tetanus) and bone density. Of course, also ask for frequent tests for any ailments you may particularly suffer. If your family of origin was not particularly emotive, expressing feelings may feel totally alien. But it’s critical for this reason: “Not expressing your love to others ultimately separates you emotionally from them,” says Tessina. Forget the old excuse: “But they already know that I love them,” and step up. It can be face-to-face or by a note sent to every person you care about, telling them how you feel about their presence in your life. According to the CDC, one out of three people aged 65 and older fall each year, and if you fall once, you are at twice the risk of falling again. Know how to protect yourself. Ask your doctor if any of your meds could be making you less stable; also ask if you might be Vitamin D deficient. Incorporate strength and balance exercises into your routine. Get your eyes checked. Make your home safe (add grab bars at the bath or shower, add more or brighter lighting in dim parts of your home, create unobstructed walkways throughout and put up railings at stairs.) And consider retiring those stilettos. If you’re like most of us, you’ve been living by a script written in childhood that highlights your weaknesses: I’m too fat, I’m not good enough a daughter/father/friend, I never finish anything I start. By the time you’re in your 60s, it’s time to rewrite the script – with YOU as the hero of your life. According to Tessina, there are three things you can do to feel better about yourself. Acknowledge with gratitude all the things in your life that make it good. Be generous to others, especially with kindness and thanks. Live by your personal ethics as a way to feel good and increase happiness. And finally, remember that if you think poorly about yourself, that’s how others will respond to you. If you think highly … well, you get the picture.